On September 29, Pope Francis gave the globe a message: to pray the Rosary every day during the Marian month of October, to protect the Church from her enemies. 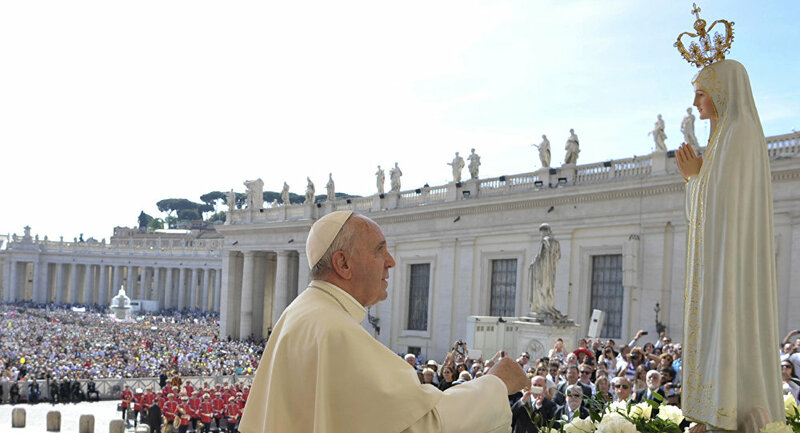 We're joining the Holy Father, and we humbly ask you to come with us, too! "The Holy Father has decided to invite all the faithful, of all the world, to pray the Holy Rosary every day, during the entire Marian month of October, and thus to join in communion and in penitence, as the people of God, in asking the Holy Mother of God and Saint Michael Archangel to protect the Church from the devil, who always seeks to separate us from God and from each other. ... [he invites us] to conclude the Rosary with the ancient invocation “Sub tuum praesídium”, and with the prayer to Saint Michael Archangel that he protect us and help us in the struggle against evil (cf. Revelation 12, 7-12). The prayer – the Pontiff affirmed a few days ago, on 11 September, in a homily at Santa Marta, citing the first chapter of the Book of Job – is the weapon against the Great Accuser who “goes around the world seeking to accuse”. Only prayer can defeat him. The Russian mystics and the great saints of all the traditions advised, in moments of spiritual turbulence, to shelter beneath the mantle of the Holy Mother of God pronouncing the invocation “Sub tuum praesídium”.